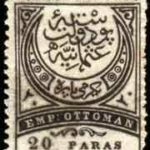 The word “Empire” in the title on the stamps “Empire Ottoman”, reads as “Ampir” and this is the reason these Ottoman stamps are called as “Ampir”. In my opinion they should be called as “Crescent Stamps”. 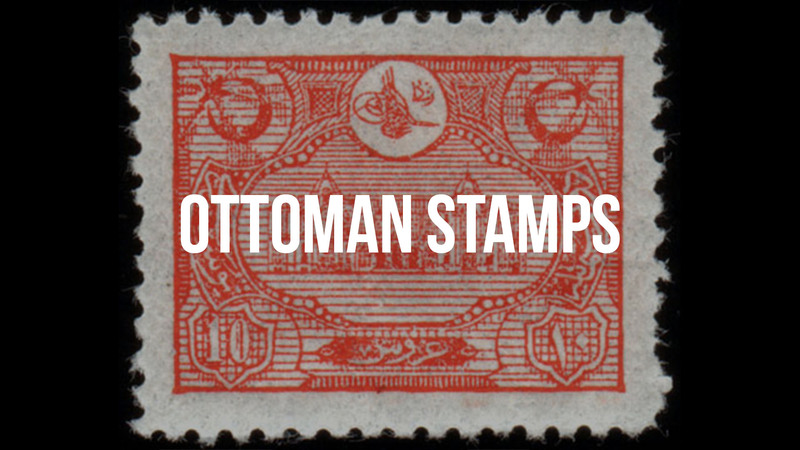 These stamps were issued because of the Universal Postal Union has been established and accepted by the states in those years. As per the regulation of the “Conference of Bern” in that time, the scripts on the stamps should also be read in French. 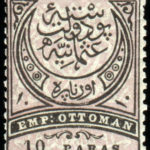 “Crescent Stamps” are the first Ottoman stamps issued in two languages. 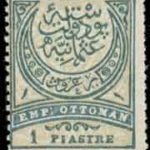 In my opinion issuing of these stamps by Ottoman Empire is not related by Sultan Abdulhamid’s ascending to the throne. 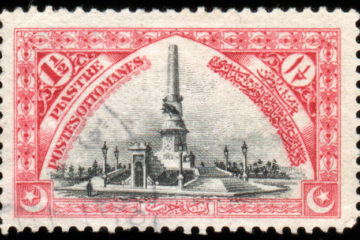 The inscription on the base of the stamp is divided in the middle and mirrored. 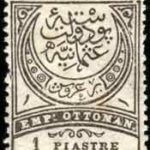 The inscription reads “Posta-i Devlet-i Osmaniye 1291” and translates “Ottoman State Post 1291”. I would like to thank to Osman Levend for his help with this inscription. The number “1291” in this inscription is the year of Islamic Calendar started in the year of “Hegria” which is equal to the years 1874-75. In this case it is 1874 –the year Bern Conference took place. The design (or base) on this stamp is lithographed and the overprint is typographed. 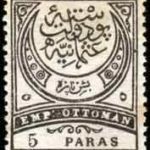 These are the first Ottoman stamps printed in two printing techniques. The red line in Figure 1 on the right is the vertical line where mirroring were applied. 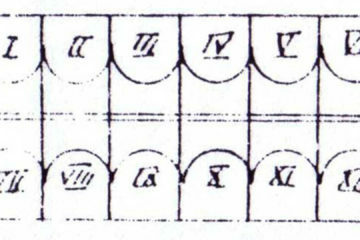 Latin alphabet and numbers on the “Crescent Stamps” are “Clarendon’s Antiqua” font. Typography is the term used to describe these font types today, but is not related to typography printing technique in those days. Issued on September 15, 1876. Perforation: between 13-1/2 and 13-1/4. 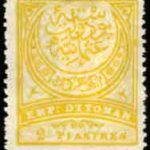 It is believed that 11-1/2 perforation has been issued for philatelists. Other perforation types are being considered as forgeries as they have printed as per special orders. 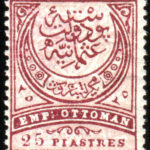 In the plates of 5 Kurus (5 Piastres), a purplish pink on light blue 25 Kurus (25 Piastres) stamp has been printed by mistake. Later on, this mistake has been recognized and corrected by the authorities. 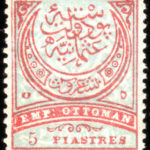 Figure 2 on the left shows the 25 Piastres stamp in between 5 Piastres stamps. 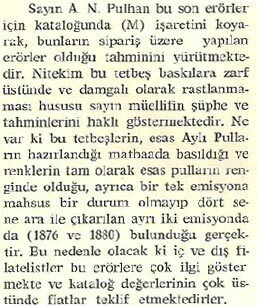 This example is from Pulhan Catalogue. Issued on May 27, 1880. 1 Piastres black on light blue. Perforation: 13-1/4 and 11-1/2. 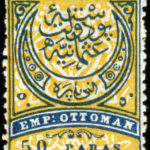 Imperforated stamps also exist. 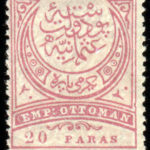 Color of 20 Paras stamp has been changed to match the regulations of the Universal Postal Union. 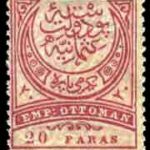 In my opinion 1876 20 Paras stamp has been terminated after 1880. Because of the dye gone bad in time in this emission, there has been color variations. We cannot call these as “color essays” because denominations on these stamps are not different than others. 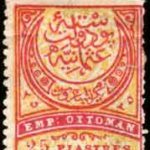 1 Piastres stamp exist as the same base color as April 13, 1881 5 Paras stamp. These stamps are the products of Mr. Clavany. 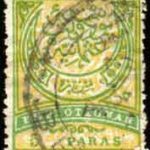 20 Paras stamp on postcards has been bisected and used on letters. Issued on April 13, 1881. Perforation: 13-1/4, 11-1/2. 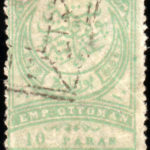 Imperforated stamps also exist. 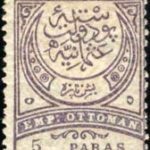 These stamps were issued due to lack of 5 Para stamps and “s” on 1 Piastres stamp was printed by mistake. 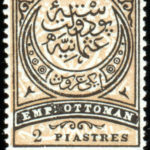 Same “1 Piastres” patterns were used in these stamps with some corrections on the patterns. In the process of correcting the patterns some errors were occurred. These errors were not only occurred in the process of correcting the patterns but also occurred because of the wear and tear of the pattern for frequent use. 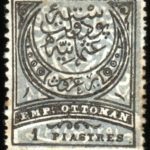 In my opinion “OTTOMAN” and “EMP.” and some other “PIASTRE” errors are connected with the frequent usage of the same pattern. 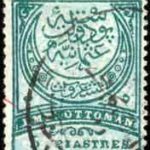 Base color variations on 1 Piastre stamp: Dark blue, greenish blue and gray blue. PIASTRE + PIASTRI + PIASTR.. It is possible that there are more errors on this “Piastre” word. There are forgeries of these error stamps. They were created by “erasing technique” to copy these errors. Erased parts of these forgeries are thinner than the entire stamp. Philatelist should be careful in buying these error stamps. In my opinion the value of these error stamps shouldn’t be different than that of the regular stamps. 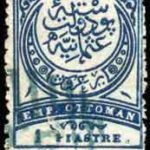 As the color of this stamp is closer to blue, it did not follow the Universal Postal Union regulations, so it has been terminated early. Color of these set of stamps followed the Universal Postal Union regulations. 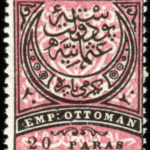 Color of overprinting of these stamps were printed darker than the base print compared to the previous emission stamps over prints were black. Perforation: 13-1/4, 11-1/2. Imperforated stamps exist. 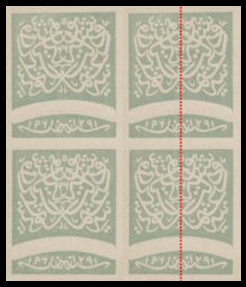 Even though the printing house has a 13-1/4 perforation tool, it is not known why they perforated these stamps with 11-1/2 perforation. I read in the related magazines of those years that there were rumors, these 11-1/2 perforations were made by the request of the philatelists of those years. 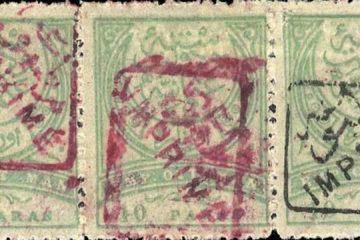 Each of these three stamps were both printed on thin and thick paper. Perforation: 11-1/2, 13-1/4. Imperforated also exist. 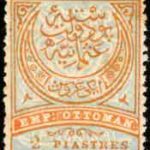 There are examples of 25 Piastres stamps with 131/4 horizontal perforation and imperforate vertically. But these stamps should be approached carefully as they could be forgeries. Even though it is said that these stamps were issued April 1, 1886, this statement is not correct. 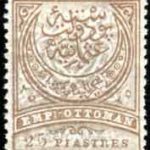 25 Piastres stamp with no base print; dark brown on white with 11-1/2 perforation. 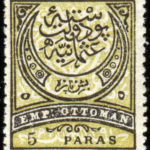 5 Paras stamp was printed with 5 Piastres color. 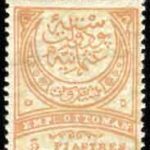 5 Paras stamp also exist surcharged “Muharrerat Ucreti” (Printed Matter Fee). 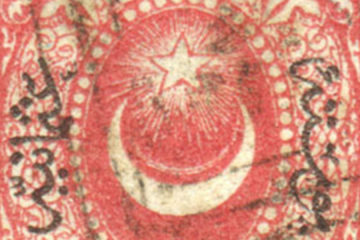 It is believed that it has been used as an official stamp. Even though I am not sure, in my opinion this stamp is another privately created “fantasy” stamp. 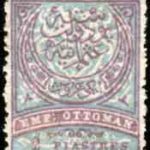 First “Official Stamp” of the Ottoman Empire. 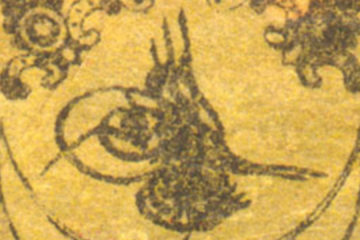 2 Piastres yellow on gray stamp (ISFILA 140) has never been mentioned in the sources in those years or after. 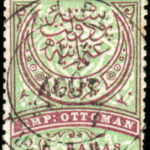 It is also not possible to use this stamp as it does not follow the Universal Postal Union’s regulations as the numbers and letters cannot be read. This stamp has not been mentioned in hand printed “printed matter” stamps either. 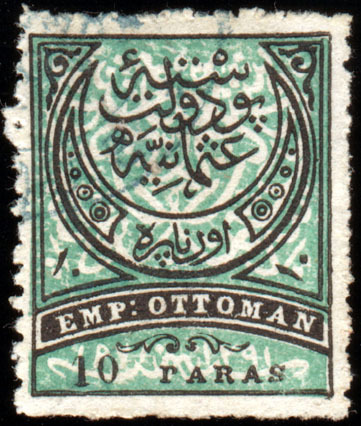 Bisected stamps surcharged with number (10, 2) or with number and letters (10 Paras, 1 Piastres, 2 Piastres) is a product of fiction and has never been used postally. Stamp is real but surcharges are fictitious. I am not sure why these stamps still exist on catalogues. 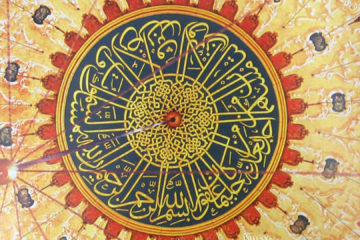 Crescent stamps are the stamps that have been forged the most in Ottoman Empire. P.C. 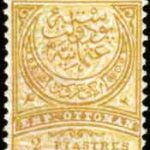 Alexan and Stefan Bukmedjian sold a lot of forgery stamps in World Philately Exhibition in Vienna 1894. 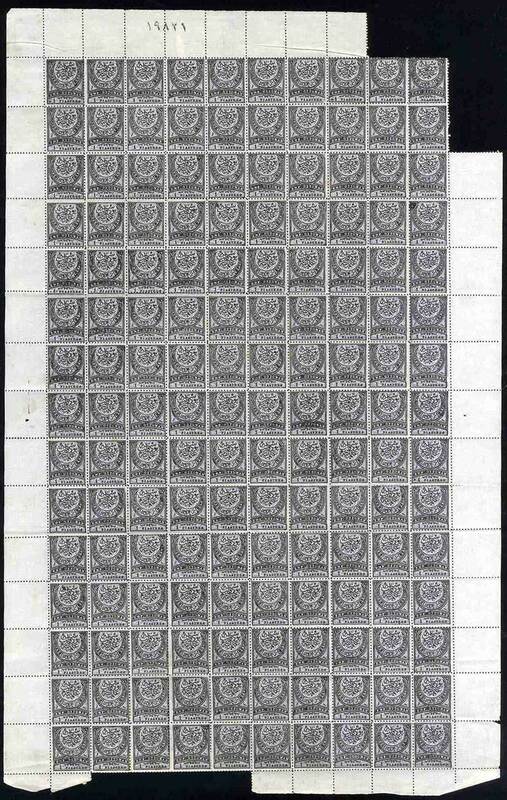 Philatelists and collectors should approach these stamps carefully even the ones with lower values. Joseph Tchakidji misinformed many European philatelists and hurt a lot of people by giving wrong information about these stamps. After many legal attempts and warnings he corrected himself in the coming years and took his place in honest philatelists. 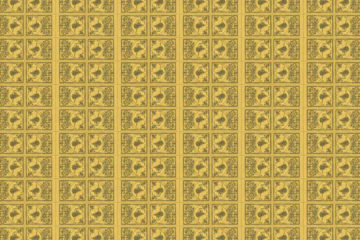 150 (10 columns x 15 rows) stamps constitute a full plate of Crescent Stamps. Are the bisected stamps given any value in today’s market ? Yes. 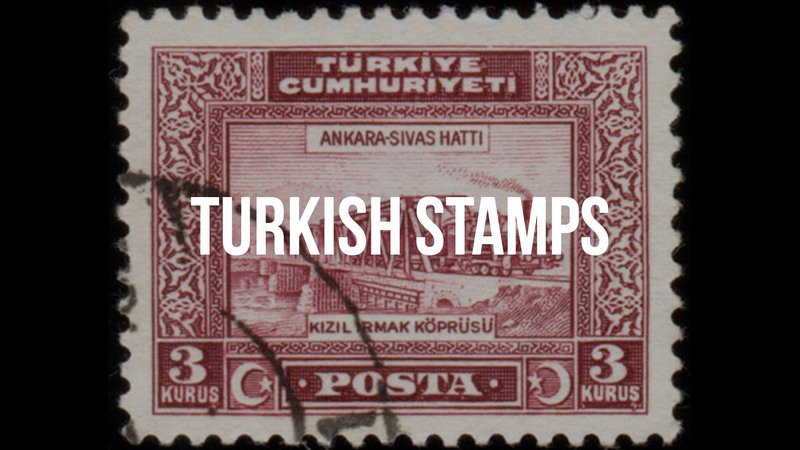 Some philatelists collect bisected stamps. 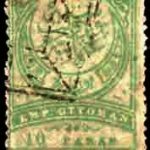 There are some mentioned in Scott Stamps Catalog. Thanks for responding. Yes Scott mentions that they were done by private people in conjunction with the post office personal……..there is no mention as to the value……any other sources one could check ?